The headroom is the main asset of the PFImob. Appropriate for an indoor or outdoor use, Its I beam profile allows to consider installation of a hoist with electric or manual steering. 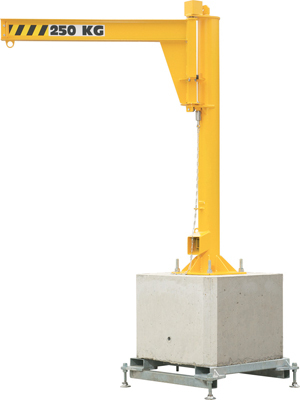 This jib crane is mounted on a movable concrete block provided. Displacement can be done by traveling crane (transport ring) or by forklift.